Those Sounds May Mean Something! Unusual car noises are often indicate that something is wrong with your car. With the summer travel period now underway here are some car noises you should not ignore. Do you ever hear a chirping or squealing sound ? A chirping or squealing sound from the front wheels can often indicate a wheel bearing or axle bearing that is failing. The best way to tell is to recognize the noise will change with the speed of the vehicle, and it may come and go at various speeds. This noise should not be ignored because if the bearing fails, it may cause the wheel to lockup or even to come completely loose from your car! Wheel bearing noise can be confused with the scraping and groaning noises common with brakes. During damp weather, moisture causes the brake pads to slightly swell, resulting in pad drag and creating annoying groaning or creaking noises. Once the pads heat up and dry out the noise will go away. But a clicking noise from a front wheel (especially if it is only heard while the wheel is turning) usually indicates a bad joint that is failing. Don’t wait- see your favorite mechanic! What is that metallic scraping or grinding noise I hear when braking? When brakes pads are damp or wet they make groaning or creaking noises, and some types of brake pads (semi-metallic pads, for example) may squeal or even squeak when they are cold. But normally brakes should be somewhat quiet when pressure is applied. If you hear a metallic scraping or grinding noise when braking it probably means your brake pads are wearing out and your car needs to have the brakes inspected. Don’t delay! Worn brakes may not allow your vehicle to stop in a safe distance. In fact, if the brakes are really badly worn, there is a risk the friction material that’s left on the pads may separate from the backing plate, potentially causing the brakes to fail. 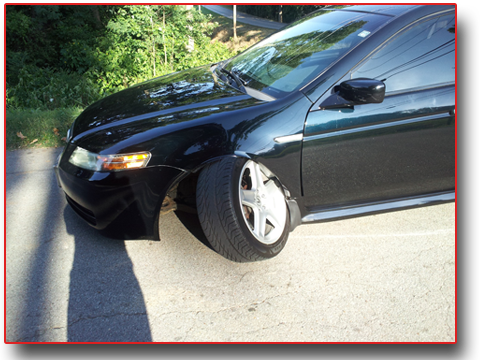 Metal-to-metal contact is also usually destructive to the rotors which will drive the cost of repairs much higher. If you hear a hissing sound from the engine compartment while driving or after turning off the engine, it may mean your engine is overheating or in need of coolant because of a leak in the cooling system. Always check the temperature gauge to see if it indicates a overheating condition, and do not continue driving (especially if you see steam) as severe overheating can greatly damage your engine. Stop your engine and open the hood. Look for any telltale evidence of coolant leaking from the engine, the radiator, or the heater hoses. If you see steam or smell a sweet odor, it is likely to be from antifreeze leaking from the cooling system. Do NOT open the radiator or coolant reservoir cap until the engine has cooled down. And do not add coolant until the engine has completely cooled down. It is important to also realize that merely adding coolant to a leaking cooling system won’t accomplish very much! The coolant will simply leak back out. But adding a can of cooling system sealer may slow or stop a small leak. A large leak, leaking water pump or hose will continue to leak even with sealer in the system and the leaky part will need to be replaced. Do not ignore the sounds your car or truck makes! Time and mileage are the enemy of your car and it is inevitable things are going to break or wear out. The key to keeping your car safely on the road is to contact your favorite mechanic if you hear a strange sound or see indication of a leak in the system.